The Dri Eaz Evolution LGR dehumidifier is a compact, light weight and effective unit ideal for use in small to medium sized restoration projects, structural drying, construction and other applications that require temporary industrial strength dehumidification. It is a well featured and convenient dehumidifier and popular with restoration specialists and other users for its ease of use. 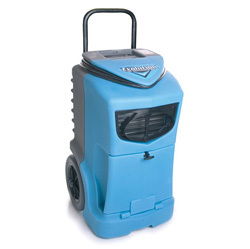 The Dri Eaz Evolution LGR dehumidifier packs a lot of power into a small and handy package. This dehumidifier will extract 70 pints of water per day from the air at 80°F and 60% relative humidity. These are test conditions under which all members of the Association of Home Appliance Manufacturers (AHAM) have dehumidifiers tested in order that different units can be meaningfully compared. The standard is, perhaps, more applicable to room dehumidifiers and does not reflect the more severe conditions which often apply during water damage restoration projects and construction work. Under conditions of 90°F and 90%RH this unit will extract up to 120 pints per day. This power is achieved through the combination of a high quality rotary compressor, an air-processing capacity of 160 CFM and, above all, Low Grain Refrigerant (LGR) technology. To simplify, LGR pre-cools the air so that more moisture is condensed onto the coils. Low Grain Refrigerant dehumidifiers are substantially more effective than conventional refrigerant units. Grains (of water) per cubic foot or per pound (of air) is a measure of the absolute amount of moisture in air. Relative humidity, on the other hand, expresses moisture content as a percentage of the capacity of water to retain moisture at a given temperature. The warmer the air the more moisture it can retain. Air at 60°F with a relative humidity of 40% would, if cooled to 40°F in an air-tight space, have a relative humidity of 80%. Low Grain Refrigerant dehumidifiers can extract water more quickly and will continue to extract water when the "grains per cubic ft" has fallen below the capacity of a conventional unit. Hence they are more effective, especially where extreme dryness is required. LGR technology also makes these units more energy efficient, as is shown by the fact that the Dri Eaz Evolution LGR has a power draw of only 5 amps. The Dri Eaz Evolution LGR is capable of effective operation across a broad range of temperatures, from 100°F down to 33°F. Low temperature operation is made possible by the hot-gas bypass defrosting system incorporated in the unit. This actively melts ice as it forms on the coils and enables the unit to operate at temperatures as low as are possible for a refrigerant unit. The Evolution discharges the condensate by continuous drainage. An internal, centrifugal pump assists the process and a 40ft drain hose is included to allow the water to be vented to a convenient outlet. All this well featured power is contained in a neat and compact design. The unit's dimensions are just 20.7 x 20.7 x 33.5 inches which allows one person operation and access to areas where apace is limited. The unit is manoeuvrable on site thanks to an integral steel handle and sturdy wheels with semi-pneumatic tyres which are puncture-resistant. With modest external dimensions and a weight of only 92lb the Evolution is portable in any vehicle and may be quickly and easily deployed to a new site and as easily recovered. The Evolution is a durable unit. Its robust components are enclosed in a tough, roto-moulded polyethylene housing which comes with a life-time warranty. The use of polyethylene keeps weight down and protects objects the unit may collide with as well as the dehumidifier. It is also easier to keep clean and "new" looking than other materials. Other features of the Dri Eaz Evolution include capacity for ducting, a high airflow filter, easy to use, recessed electronic touch-pad to control the unit and a seven year conditional warranty on the working parts.